Valentine’s Day this year was really fun for me because I normally don’t do anything special for it. Not to say that I have some sort aversion to the day as a single individual, but I’ve never had the opportunity to properly celebrate it with a few close friends due to schedules and a lack of interest amongst certain friends. A couple of friends and I decided that we should celebrate the evening together at a restaurant. Unfortunately, our original plans were thwarted because the Korean restaurant I wanted to try out was closed on Mondays. Not reaping profits on Valentine’s Day? That sounds like a lost opportunity to me. So, off to a Thai Imbiss we went! The most interesting part of the night was at the very beginning when we discussed how Valentine’s Day is celebrated in the US. My flatmate, P, and a German, K’s new flatmate, were surprised that Americans sometimes include their friends and families in their Valentine’s Day sentiments (in a non-romantic way, of course). The Germans and Brits dedicate the day entirely to romantic interests and significant others, which means that children do not partake in this capitalist holiday’s activities (at least, until they start developing crushes). The Americans at dinner explained the tradition of giving every classmate in school a valentine, and what these valentines generally are. Why give them to everyone? someone asked. Because you don’t want Johnny to get 6 valentines and some other boys none. (Trust me…I would know. Jennifer or Stephanie would’ve gotten 10, whereas I would’ve gotten none if Americans celebrated it the way the Brits and Germans do.) K’s flatmate’s response? “Wow…that is very American.” Amen to that, was my response. But puuuhhllleeeaaazzeee…you can get around this whole equality thing easily, even as children. You embellish specific valentines for your close friends and that crush you’ve been pining for. Believe me, I’ve been there. The others were quite amused at this. Well…what’s the point of including everyone if it’s a day that’s supposed to be only dedicated to romance? This question was thrown around a few times. Again, I proudly defended my American traditions. Well…what’s the point of having one day out of the year designated for buying jewelry, chocolate or some other non-useful present to your significant other when you technically should be thinking about them every single day? If anything, Americans have it right because as far as I’m concerned, there was nothing that made me happier as a child than receiving chocolate and candy for no significant reasons. So, I celebrated V-day the right way this year by making valentines for all my friends present at the dinner. I also made valentines for my 5th grade class and distributed them last week because I was unfortunately sick the week of Valentine’s Day. I even had a little chocolate present inside (see picture). 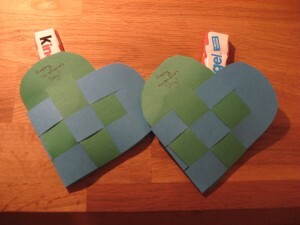 Pocket valentine hearts with chocolate inside = the happiest 10-year-old’s in the world. Even the boys were thrilled. 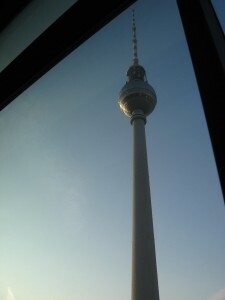 The TV tower at Alexanderplatz. This entry was posted in Jill Nguyen '10, Fulbright to Germany and tagged Valentine's Day. Bookmark the permalink.